Hello again from Baltimore County Public Schools! Since adopting Guided Inquiry Design as the process for our Online Research Models (ORMs) in 2012, we have provided professional learning for school library media specialists and teachers to promote and support its use with students. At the start of the 2012 school year, we purchased a copy of Guided Inquiry Design: A Framework for Inquiry in Your School for each of our school librarians. We engaged in a book study during the 2012-13 school year, coming together in Elementary, Middle, and High school groups to discuss our learning at quarterly half-day Professional Development sessions. This helped to ensure that all school librarians had a solid foundation in the GID model and would be able to use it– not only for facilitating our curriculum-aligned Online Research Models district wide, but also for designing customized research tasks in collaboration with classroom teachers at their own schools. Since 2014, the BCPS Office of Digital Learning has offered an after-school workshop called Facilitating Student Research each fall and spring to support K-12 teachers in all content areas with using our ORMs and Guided Inquiry in the classroom. This workshop is a module in our Digital Learning University (DLU) continuing professional development course. DLU allows teachers to design their own professional learning by choosing 5 workshops from a variety of offerings during the school year for credit. The Facilitating Student Research workshop features our Online Research Models and highlights the 8 phases of GID. 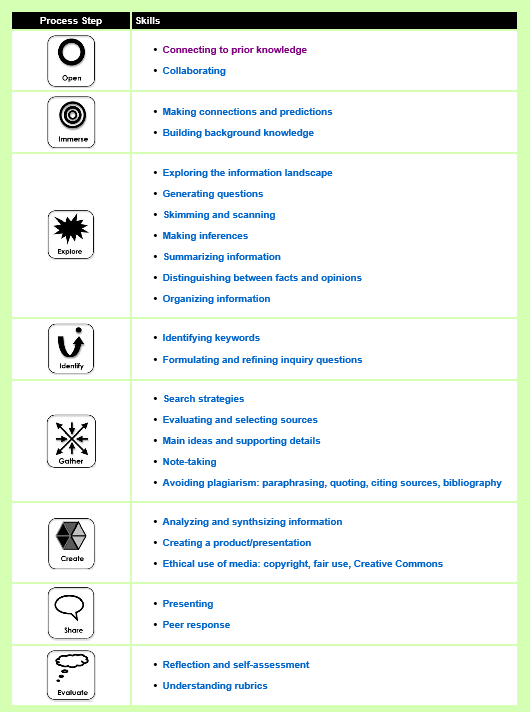 In 2013, the Library Media team was asked to design a research portal for a Grade 6 Reading course focused on CCSS-aligned skills for conducting research to build and present knowledge. The portal would structure the inquiry-based process, connect to curriculum lessons, and curate resources for the Performance-Based Assessments (PBAs) for each unit. 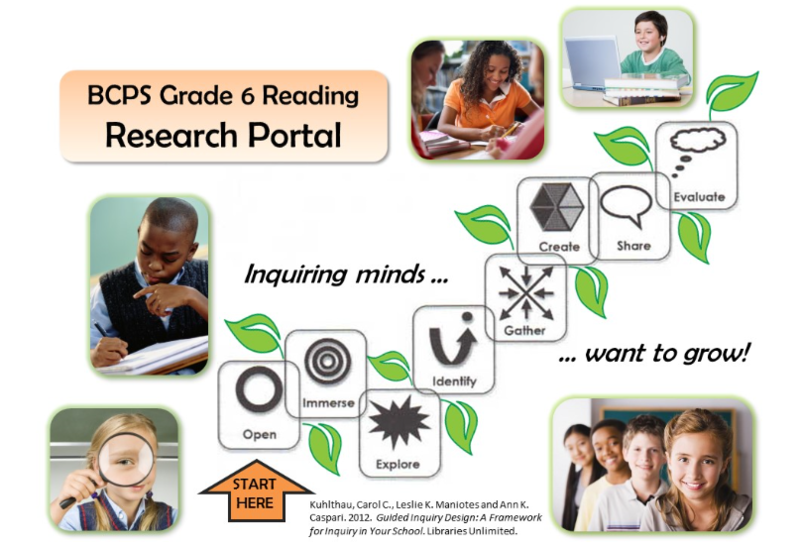 We used GID to create this Grade 6 Reading Research Portal, which has been used for the last three years and will be revised this summer based on curricular changes and ongoing feedback from students, teachers and librarians. In 2014, we began designing an online Grades 5-8 Research Guide structured using the 8 phases of GID. Our idea was to curate skill-building resources and tools aligned to each GID phase. We also plan to link to resources in this guide in our ORMs. We plan to continue revising and improving this resource this summer. Our work in promoting and facilitating the use of Guided Inquiry in BCPS has not been without its challenges. We do have some goals for expanding our use of the model, and for using it in more impactful ways for students. I’ll talk about our next steps in another post later this week.